There's a reason that, every year, people who don't even like football tune into the Super Bowl just to watch the ads. Car commercials, what with the auto industry's disturbingly large budgets and all, are always among the very best. Of course, they've evolved quite a bit since the early days of the Super Bowl, when a commercial might be as stupidly basic as a future hall-of-famer holding up a bottle of coolant in a parking lot. Here are our all-time favorite Super Bowl car ads over the years (and here's a peek at what you can look forward to on Sunday). OK, yes, this isn't technically a commercial for a car -- I mean, it's selling something that absolutely, positively does not mix with cars -- but the entire thing is a tribute to the late, great Paul Newman, and his then-relatively new, soon-to-be dominant racing team. PLN: This Bud's for you. "So I had this dream..." If you get the impression that the 300ZX's ad is as much Hollywood blockbuster as it is car commercial, you're on to something -- it was directed by Ridley Scott. You know, the guy that did Aliens. It's hilarious that Pontiac commissioned an entire song specifically about this car's exhaust. Legend has it that the higher-ups were more than a little pissed at the brash image the ad expressed. It's also great because this ad came out a full three years before American Graffiti. Shows what the higher-ups knew about what people wanted to see and hear huh? It's a ballsy move, featuring a frozen corpse in your commercial for a brand-new car. You can almost picture a bunch of ad-types huddling outside a coffee shop in the dead of winter, saying, "It's a convertible. WTF are we gonna do?" "I don't know, but I'm freezing to death out here." "That's IT! You're a genius." There are two obvious truths pertaining to this commercial: 1) Barbie has a thing for ex-military guys in red convertibles. 2) G.I. Joe and Ken duking it out over Barbie is a much better premise for a movie than Toys. The GT is a deeply emotional car, and Ford's showstopper from the last decade was the first since the 1960s. Ford's ad team knew exactly what to do for a car that speaks for itself: nothing. As an obvious spoof on The Godfather, the beauty of this ad is its simplicity. If ever an ad could've used a sequel full of vintage flashbacks, this was it. While it might not be flashbacks, per se, Audi struck gold with Jason Statham in an advertisement-slash- short film on the history of car chases. Naturally, he ends up in an A6, but the potshots at rivals like Lexus and BMW are what make this one great. Not every car commercial company gets it, but whoever did the ad work for Mercedes' "Welcome" commercial certainly does. Far more than just a clever way of illustrating brand history without using a single flashback, it's anthropomorphism at its finest, presenting decade after decade of Mercedes tradition while simultaneously implying that the car-with-a-soul in your garage emotionally links you to the newest showroom models. Oh yeah, and Sean "P. Diddy" Combs is in it. 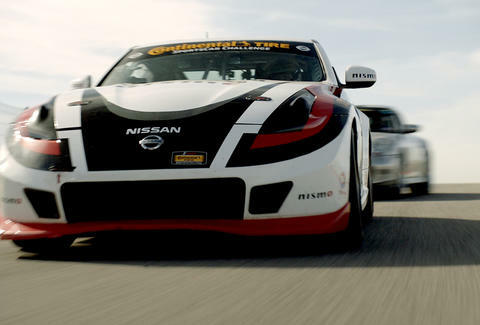 Last year, Nissan proved that, 35 years after Budweiser's Paul Newman ad, racing still plays well during a football game. If you don't get at least goosebumps and a lump in your throat watching the single best Super Bowl commercial from 2015, you're dead inside. Last year, this ad wouldn't have made this list. This year, though, there's a beautiful juxtaposition to be found in Volkswagen-owned Audi running a commercial about environmental police shaming people for minor "infractions" of a green lifestyle, while lauding the "clean diesel" A3 TDI -- which is currently right in the thick of Dieselgate. Aaron Miller is the Cars editor for Thrillist, and can be found on Twitter. He's still a little choked after watching the Nissan motorsport ad.